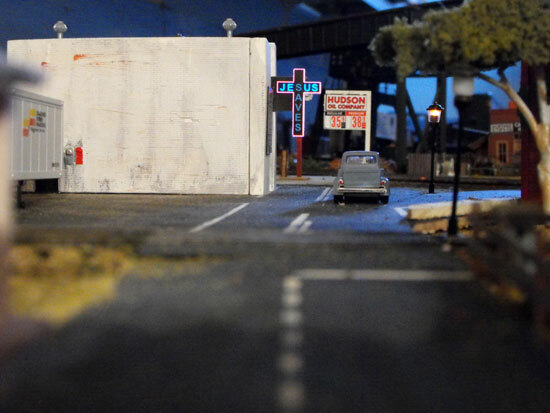 While working on the semi-urban scenery around Mintwood on my previous Utopia Northern HO model railroad I had installed a Rescue Mission kit by Downtown Deco. (Kit DD1034). After I had installed the building I decided to dress it up with an animated sign. I have seen these signs by Miller Engineering at train shows and advertised in the Walthers flyers. Here was a scene just begging for an animated sign. The sign I ordered was the "Jesus Saves" animated neon sign (Kit #9072) under the Light Works USA label by Miller Engineering. The signs are not inexpensive so I don't expect to install very many. First I wanted to see how easy it would be. The animated sign comes with its own power supply that operates with 3 AAA batteries (4.5 volts). It's essentially a plug-n-play module. The sign has 46 chase patterns that are cycled through by pushing a button. This provides a variety of options to suit individual preferences. The Rescue Mission building is made with hydrocal plaster castings. It was necessary to cut a slot in the wall so I could insert the sign through the wall. The animated sign has two sides that need to be pulled apart slightly and carefully inserted into female plugs. The plugs are attached to a short cable that is connected to the power supply. I used a small drill bit to cut some holes where I wanted the slot and then used an X-Acto knife to file out the slot. If you want to install this type of sign it would be better to preplan the operation before the building wall is assembled. In my case it was an afterthought. I also had to drill a hole and slot wide enough to pass the plug and cable through the benchwork. The cable is about 18 inches long. The module has an on-off switch and an adhesive backing for mounting. The cable wasn't long enough to reach the edge of my benchwork so it was a little awkward to reach the module's power switch. I'll install this differently on the new UNRR. The cable is a ribbon type and I didn't want to mess around with trying to extend it. I simply turned it on before operating sessions or before visitors came to see the layout. One needs to be careful to avoid bending the contacts too much when inserting them. The wafer-thin animated sign sides need to be gently inserted. There are dots to help provide correct alignment. The installation is simple and practically foolproof. Some of the Miller Engineering signs are multi-graphic, in which case you simply peel off the one you want to use. The animated sign is a real eye-catcher. Go from "animated-sign" to Bar Mills Mortimer Stiph's Kit. Go from "animated-sign" to Blair Line kit building tips. Return from "animated-sign" to my Home Page.